Developing new adjuvants and vaccination strategies is of paramount importance to successfully fight against many life-threatening infectious diseases and cancer. Very few adjuvants are currently authorized for human use, and these mainly stimulate a humoral response. However, specific Abs are not sufficient to confer protection against persisting infections or cancer. Therefore, development of adjuvants and immunomodulators able to enhance cell-mediated immune responses represents a major medical need. We recently showed that papaya mosaic virus nanoparticles (PapMV), self-assembled from the coat protein of a plant virus and a noncoding ssRNA molecule, are highly immunogenic in mice. PapMV can be used either as a vaccine delivery platform, through fusion of various epitopes to the coat protein or as adjuvant to enhance humoral immune responses against coadministered Ags or vaccines. However, the mechanisms that confer these immunomodulatory properties to PapMV and its ability to enhance T cell vaccines remain unknown. Using immunization studies in mice, we demonstrate in this paper that PapMV represents a novel TLR7 agonist with strong immunostimulatory properties. More importantly, pretreatment with PapMV significantly improves effector and memory CD8+ T cell responses generated through dendritic cell vaccination increasing protection against a Listeria monocytogenes challenge. Vaccination is considered to be the most effective method of protection against infectious diseases. Indeed, vaccines have not only helped to reduce the incidence of several infectious diseases such as measles or diphtheria but also contributed to the decrease in mortality and morbidity related to infectious diseases and in the eradication of smallpox (1, 2). However, the generation of safe vaccines with the capacity to generate protective cellular immunity, which is essential to protect against most chronic infections (3, 4) and cancers (5, 6), is still a challenge. Cell-mediated immune responses are often induced following the detection of pathogen-associated molecular patterns (PAMPs) by APCs leading to their activation, which increases their stimulatory capabilities toward pathogen-specific T lymphocytes. This has led to the development of numerous vaccination trials that include various PAMPs in the formulation of candidate vaccines (7–9) instead of traditional adjuvants such as alum, which mostly induces a humoral response (10). As such, TLR7/8 ligands that induce the production of IL-12 and IFN-α, which are important for the generation of an appropriate cellular immune response, are actively being evaluated for this purpose (11). Unfortunately, the natural ligand of TLR7/8, ssRNA, when used alone, is rapidly degraded in vivo (12, 13). To solve this problem and allow optimal presentation of vaccine Ags, researchers have developed various delivery systems to increase the bioavailability of such molecules. These tools include molecules that induce the formation of aggregates such as alum, liposomes, oil in water emulsions and nanoparticles (14). These formulations of vaccine Ags increase their phagocytosis by APCs, the first step required to generate a potent immune response. Another way to efficiently trigger a T cell response is to mimic a viral infection through the use of virus-like particles (VLPs). VLPs do not contain infectious genetic material, providing a safer alternative to attenuated or inactivated viruses (15). In addition, the shape of such particles and the display of repeated arrays of epitopes on their surface renders them easily recognizable by APCs that are then activated by intrinsic PAMPs present on the VLPs (16). However, many VLPs in development still require the coadministration of adjuvants to be fully effective (17, 18). VLPs can easily be engineered to express foreign epitopes using genetic fusion or chemical conjugation (19–21). At present, there are two vaccines used in humans derived from VLPs: The hepatitis B virus vaccine and the human papillomavirus vaccine. We have previously shown that papaya mosaic virus-like nanoparticles (PapMV) are efficiently recognized and taken up by immune cells leading to their activation (22). In addition, we have shown that various foreign Ags can be fused to the surface of the PapMV without affecting its ability to self-assemble. Vaccination with such nanoparticles generates a specific cellular and humoral immune response against displayed Ags and provides protection against various viral infection models (19, 22–25). Moreover, we have demonstrated that the fused Ags are efficiently cross-presented on MHC class I of human APCs and cause the expansion of human Ag-specific T cells (26). Finally, we recently showed that PapMV used as an immunomodulator leads to the development of protective immune responses against influenza or Streptococcus pneumoniae challenges (27). Thus, PapMV represents a promising candidate adjuvant for the development of novel vaccines or treatments. However, the mechanisms by which PapMV activates the immune system are unknown. We demonstrate in this study that PapMV induces immune activation through TLR7 ligation and type I IFN production. In addition, PapMV enhances effector and memory CD8+ T cell responses induced through bone marrow–derived dendritic cell (BMDC) vaccination increasing protection against a Listeria monocytogenes challenge. These results suggest that PapMV could be useful for the development of T cell vaccines against infectious diseases. This study was performed in accordance with the Canadian Council on Animal Care guidelines. All animal experiments were reviewed and approved by the Institut National de la Recherche Scientifique - Institut Armand-Frappier institutional animal care committee. Female 6- to 10-wk-old C57BL/6 mice were purchased from Charles River Laboratories. Tlr7 knockout (KO) and Myd88 KO mice were purchased from The Jackson Laboratory. Type I IFNR KO mice (Ifnar KO) on a C57BL/6 genetic background were provided by U. Kalinke (Institute for Experimental Infection Research, Braunschweig, Germany), and Irf5/7 KO mice were provided by P. Pitha-Rowe (Johns Hopkins University, Baltimore, MD). PapMV nanoparticles used in this study were provided by Folia Biotech and were produced as described in our previous study (27). LPS contamination was always <50 endotoxin units/mg protein and considered as negligible. BMDC were differentiated as described previously (28). On day 6, LPS (Sigma-Aldrich) (1 μg/ml) was added to cultures to induce maturation, and the OVA257–264 peptide (SIINFEKL) (2 μg/ml) (Midwest Bio-Tech) was added (BMDC-OVA) or not (unloaded BMDC) overnight. BMDCs were harvested on day 7. PapMV (Folia Biotech) injections were done i.v. or s.c. with 100 μg. For BMDC-OVA immunization experiments, 100 μg PapMV or 100 μl PBS was injected i.v. or s.c. 6 h before i.v. or s.c. immunization with 1.25 × 106 mature BMDC-OVA or unloaded BMDC. OVA-specific CD8+ T cell responses were analyzed at days 7 and 45 postimmunization in the spleen or blood. To follow BMDC phenotype following immunization, BMDC were labeled with 5 μM CFSE (Life Technologies) for 10 min at 37°C. Wild-type (WT) mice were injected i.v. with 100 μg PapMV or PBS and 6 h later with 10 × 106 BMDC-CFSE. The expressions of CD86 and CD70 were then analyzed on the CD11c+CFSE+ population, 6 h after BMDC immunization. Mice were infected with 2–5 × 103 L. monocytogenes expressing OVA (L. monocytogenes-OVA) i.v. at least 45 d post-BMDC immunization. Five days postinfection (p.i. ), the spleen and liver were harvested and homogenized in distilled water plus 0.5% Nonidet P-40 (Sigma-Aldrich), and fold serial dilutions were plated onto brain heart infusion (BD Biosciences) agar plates containing 200 μg/ml streptomycin (Bio Basic). Plates were incubated at 37°C for 24 h, and colonies were enumerated. The hybridoma cell line producing mAb 927, specific for the mouse bone marrow stromal Ag 2 (BST2), used for the depletion, was provided by Dr. M. Colonna (Washington University School of Medicine, St. Louis, MO). Depletion was done as described previously (29). Briefly, mice were injected (i.p.) with 500 μg purified Ab 927 or an isotype control 24 and 48 h before PapMV immunization. Depletion leads to a reduction of at least 60% of plasmacytoid DC (pDC) numbers in the spleen as measured by flow cytometry. Flow cytometry analysis of mouse surface Ags was performed with the following Abs: anti-CD69 (H1.2F3), -CD86 (GL1), -CD11c (N418), -CD8a (53-6.7), -CD45R/B220 (RA3-6B2), -CD19 (6D5), -CD317 (PDCA-1) (927), and -CD44 (IM7) (BioLegend) and H-2Kb (AF6-88.5.5.3) (eBioscience). Staining was performed for 20 min at 4°C. H-2Kb-OVA monomers were purchased from CANVAC tetramer core facility, and tetramers were generated using extravidin-PE (Sigma-Aldrich). PE-coupled Kb-OVA tetramer staining was done at 37°C for 15 min. For intracellular cytokine staining, splenocytes were cultured with OVA (2 μg/ml) in the presence of brefeldin A (10 μg/ml) for 5 h at 37°C. Following staining for surface Ags as described above, cells were stained for intracellular cytokines using fixation/permeabilization buffer (BioLegend), according to the manufacturer’s instructions. Abs used for intracellular cytokine detection were anti–IFN-γ (XMG1.2), –TNF-α (MP6-XT22), –IL-2 (JES6-5H4) (BioLegend), and -granzyme B (eBioscience). Flow cytometry analyses were performed on a BDLSRII or BDLSR fortessa flow cytometer (BD Biosciences), and data were analyzed using the FlowJo software (Tree Star). PapMV-specific Ab titers were determined as described previously (30). Results are expressed as an Ab end-point titer, determined when the OD value is 3-fold greater than the background value obtained with a 1:50 dilution of serum from PBS-injected mice. IFN-α and IL-6 levels in sera and spleen homogenates from immunized mice were determined following the manufacturers’ instructions (PBL IFNSource and BioLegend). Data were analyzed for statistical significance using Student t test. Statistical significance was determined as p < 0.05. To evaluate the extent of the immunomodulatory properties of PapMV, we first measured the activation of various immune cells following i.v. immunization of C57BL/6 WT mice. We analyzed the expression of costimulatory molecule CD86, early activation marker CD69 and MHC molecule H-2Kb by flow cytometry in the spleen, peripheral lymph nodes, and blood. 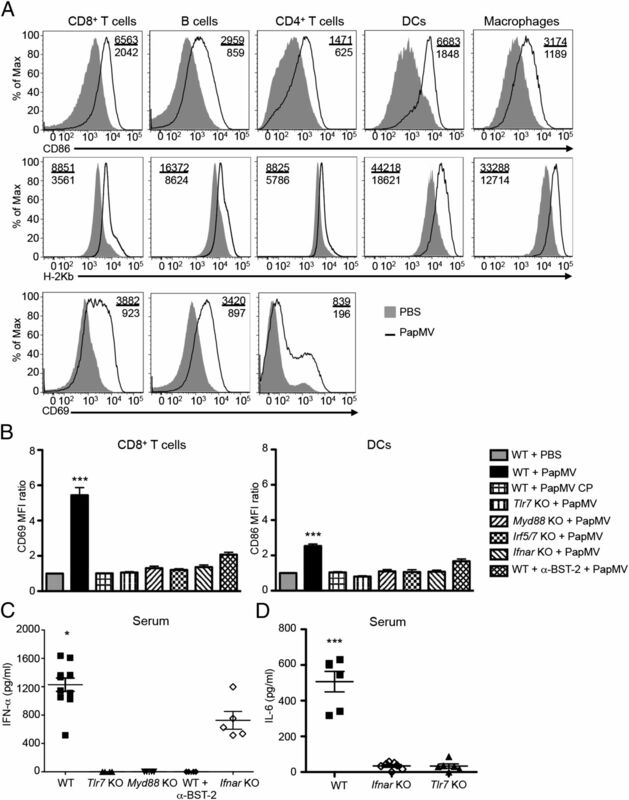 We observed that every subtype of immune cells analyzed expressed higher levels of CD86, CD69, and H-2Kb 24 h following administration of PapMV (Fig. 1A, Supplemental Fig. 1). For example, a 5-fold increase in the expression level of CD69 on splenic T cells was measured in the PapMV-treated group in comparison with PBS-treated controls. To determine which component of the PapMV was responsible for its immunomodulatory properties, mice received either the coat protein (CP) subunit alone (containing monomers, dimers, and trimers of the CP) or the complete nanoparticle. In contrast to intact PapMV nanoparticles, immunization with the CP alone did not lead to an increased expression of CD86, CD69, or H-2Kb on splenic DCs, B cells, or CD8+ T cells when compared with negative controls (Fig. 1B, Supplemental Fig. 1B). This suggests that the ssRNA molecule contained within the VLP could be responsible for its immunomodulatory properties. To confirm this hypothesis, we immunized mice deficient in the ssRNA sensor TLR7 or molecules involved in its signaling pathway and measured immune cell activation. In contrast to WT mice, the expression levels of CD86, CD69, or H-2Kb on splenic DCs, B cells, or CD8+ T cells in Tlr7, Myd88, or Irf5/7 KO mice remained unchanged upon treatment with PapMV (Fig. 1B, Supplemental Fig. 1B). Because activation through TLR7 signaling can lead to type I IFN production, we tested whether PapMV induced the production of IFN-α in immunized mice. Indeed, immunization with PapMV leads to the production of IFN-α in the serum and spleen of WT mice with a peak at 6 h postimmunization, whereas it was completely undetectable in Tlr7 or Myd88 KO mice (Fig 1C, Supplemental Fig. 2A). We next sought to determine the contribution of pDCs, which strongly express TLR7 and secrete high amounts of IFN-α, to this response. We depleted pDCs by injection of a neutralizing Ab directed against BST2, which has been shown in steady-state conditions to be mostly expressed on pDCs (31). In vivo depletion of BST2+ cells reduced IFN-α production in serum below the detection limit (Fig. 1C) and significantly decreased the expression levels of activation markers on immune cells following PapMV immunization (Fig. 1B, Supplemental Fig. 1B). Because depletion of BST2+ cells caused such a dramatic decrease in the activation of immune cells with no detectable IFN-α production, we next assessed the importance of this cytokine in the immunomodulatory effect of PapMV. Although IFN-α production remained high following PapMV immunization in Ifnar-deficient mice (Fig. 1C), expression levels of CD86, CD69, and H-2Kb in splenic DCs, B lymphocytes, and CD8+ T cells were not increased demonstrating a crucial role played by type I IFN signaling in PapMV-dependent immune activation (Fig. 1B, Supplemental Fig. 1B). Finally, we observed that immunization with PapMV leads to IL-6 production in the serum and spleen of WT mice but not in Ifnar KO and Tlr7 KO mice (Fig. 1D, Supplemental Fig. 2B). Taken together, these results demonstrate that injection of PapMV in mice induces the activation of a broad range of immune cells through IFN-α production by pDCs in a TLR7-dependent manner. TLR7, MYD88, IRF5/7, and IFNAR are essential for the activation of murine splenocytes by PapMV. (A) Representative overlay histograms showing CD86, CD69, and H-2Kb expression on CD8+ T cells, B cells (CD19+), CD4+ T cells, macrophages (F4/80+), and DCs (CD11c+) of WT mice 24 h after i.v. immunization with PapMV (bold lines) or PBS (filled histograms). (B) Compilation of CD69 and CD86 expression on CD8+ T cells and DCs 24 h postimmunization. Results are presented as a ratio of the mean fluorescence intensity (MFI) of the analyzed sample on the MFI of the PBS sample. Results are shown as the mean ± SEM. ELISA quantification of serum IFN-α (C) or IL-6 (D) 6 h postimmunization with PapMV (n = 3; two to five mice per group). *p < 0.05, ***p < 0.001. To determine whether ligation of TLR7 and strong IFN-α production induced upon injection of PapMV affects the generation of the adaptive immune response, we first analyzed the development of PapMV-specific Abs. We observed that Tlr7 and Myd88 KO mice produced significantly reduced amounts of PapMV-specific IgG and IgM in serum compared with WT mice (Fig. 2). In contrast to early immune activation, production of PapMV-specific Abs was not greatly affected by the absence of IFNAR because production of PapMV-specific IgG (Fig. 2A) was only slightly delayed in Ifnar KO mice, whereas IgM levels were not affected at day 7 postimmunization (Fig. 2B). In addition, we observed that immunization with PapMV induced the production of high titers of IgG2c and IgG3 isotypes and low titers of IgG1 isotype (Fig. 2C). These results demonstrate that activation through TLR7 and MYD88 is important to induce the development of PapMV-specific Ab responses, whereas absence of type I IFN signaling only slightly delays IgG production. TLR7 and MYD88 are important for the humoral response generated following PapMV nanoparticle immunization. (A) Kinetics of anti-PapMV IgG production in serum of WT, Ifnar KO, Tlr7 KO, and Myd88 KO mice following immunization with PapMV measured by ELISA. (B) Anti-PapMV IgM production at day 7 postimmunization in serum of WT and KO mice. (C) IgG isotypes (IgG1, IgG2c, and IgG3) titer in the serum of WT mice 20 d postimmunization (n = 3; two to five mice per group). ***p < 0.001. Several studies have shown that TLR7 ligands and IFN-I can act as adjuvants for the induction of cellular immune responses (9, 11). Moreover, BMDC immunization is a promising type of vaccination to induce CD8+ T cell responses against loaded Ags (32). We therefore investigated the adjuvant potential of PapMV for the induction of CD8+ T cell responses generated following vaccination with BMDC-OVA. BMDC-OVA were injected at the peak of IFN-α production following PapMV administration (6 h), and the generation of an effector CD8+ T cell response was analyzed. At day 7 postimmunization (peak of the response), PapMV-treated mice immunized with BMDC-OVA showed significantly higher proportions (Fig. 3A) and numbers (Fig. 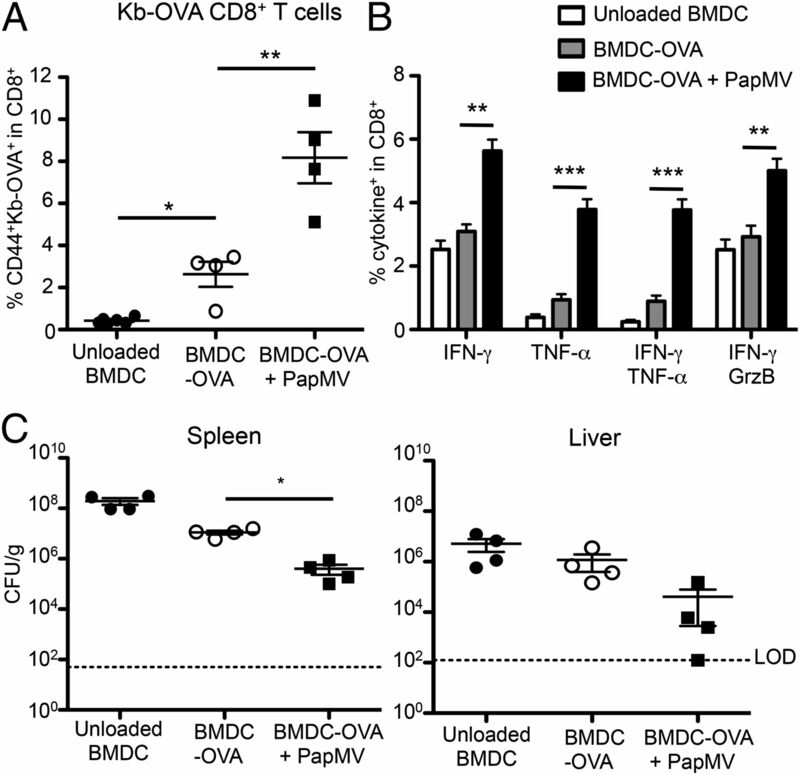 3B) of OVA-specific CD8+ T cells in comparison with mice receiving only BMDC-OVA. Moreover, PapMV pretreatment increased the functionality of OVA-specific CD8+ T cells because they produced more IFN-γ, TNF-α, and IL-2, following in vitro restimulation (Fig. 3A, 3C). Mice deficient in TLR7 treated with PapMV did not show any increase in OVA-specific CD8+ T cell numbers, whereas Ifnar KO mice showed only a slight increase (Fig. 3D). Moreover, pretreatment of mice with PapMV increases the expression of costimulation markers such as CD86 and CD70 (Fig. 3E) and MHC molecule H-2Kb (data not shown) on BMDC. Finally, administration of PapMV significantly increases the proportion of OVA-specific memory CD8+ T cells at day 45 postimmunization (Fig. 3F). In addition, this pretreatment slightly increased the proportion of cells that produce IFN-γ, TNF-α, and IL-2, although this did not reach statistical significance (Fig 3G). Similar results were obtained when PapMV was injected by the s.c. route 6 h before s.c. BMDC immunization (Supplemental Fig. 3). PapMV administration increases the number of OVA-specific effector and memory CD8+ T cells generated by BMDC-OVA immunization. (A) Representative results of the percentage of Kb-OVA CD8+ T cells (upper panel) or that produce IFN-γ following restimulation with OVA (lower panel). Compilation of the numbers of OVA-specific CD8+ T cells in the spleen (B) or CD8+ T cells producing IFN-γ, TNF-α or IL-2 after OVA restimulation (C). (D) Measurement of the increase in the numbers of OVA-specific CD8+ T cells in the spleen detected following pretreatment with PapMV in WT, Tlr7 KO, and Ifnar KO mice. The fold increase was calculated by dividing the number of OVA-specific CD8+ T cells in the BMDC-OVA + PapMV group by that of the BMDC-OVA group. (E) Representative overlay histogram of CD86 and CD70 expression on BMDCs (CD11c+CFSE+) 6 h postimmunization in the spleen of WT mice pretreated with PBS (filled histogram) or PapMV (bold line). Proportions of Kb-OVA CD8+ T cells (F) and cytokine producing CD8+ T cells (G) detected following splenocyte restimulation 45 d postimmunization (n = 3; three mice per group). *p < 0.05, **p < 0.01, ***p < 0.001. We next investigated whether administration of PapMV prior to BMDC-OVA immunization could provide greater protection against a bacterial challenge at the memory stage. To address this question, we infected mice at day 45 postimmunization with L. monocytogenes-OVA. As shown in Fig. 4A, mice immunized with BMDC-OVA showed a greater proportion of OVA-specific CD8+ T cells in the spleen compared with the unloaded BMDC group at day 5 postinfection, indicating that OVA-specific memory CD8+ T cells expanded following infection with L. monocytogenes-OVA. More interestingly, PapMV treatment increases the secondary CD8+ T cell response when compared with BMDC-OVA treatment alone group because there are a greater proportion of OVA-specific secondary effector CD8+ T cells (Fig. 4A) and more CD8+ T cells producing TNF-α or IFN-γ in the PapMV-treated group (Fig. 4B). In addition, more polyfunctional CD8+ T cells producing both IFN-γ and TNF-α or IFN-γ and granzyme B were induced in the PapMV-treated group (Fig. 4B). This led to fewer L. monocytogenes-OVA in the spleen and liver of the PapMV-treated group compared with the group vaccinated with BMDC-OVA alone (Fig. 4C). In summary, administration of PapMV 6 h before BMDC-OVA immunization results in an increased CD8+ T cell memory response and better protection against a bacterial challenge. PapMV increases the quality of the immune response generated by BMDC-OVA vaccination and protection against L. monocytogenes-OVA. Compilation of the percentage of CD44+Kb-OVA+ CD8+ T cells (A) and CD8+ T cells that produce cytokines following OVA restimulation (B). (C) Numbers of L. monocytogenes-OVA CFU per gram of spleen and liver enumerated 5 d postinfection (n = 3; four mice per group, a representative experiment is shown). *p < 0.05, **p < 0.01, ***p < 0.001. LOD, Limit of detection. The efficiency of PapMV nanoparticles when used as adjuvant or as a vaccine platform has been largely demonstrated (19, 22–24, 30, 33, 34). In this study, we have elucidated the mechanism by which PapMV induces immune activation and demonstrated its potential as an adjuvant for T cell vaccination. In previous studies, we showed that following i.v. 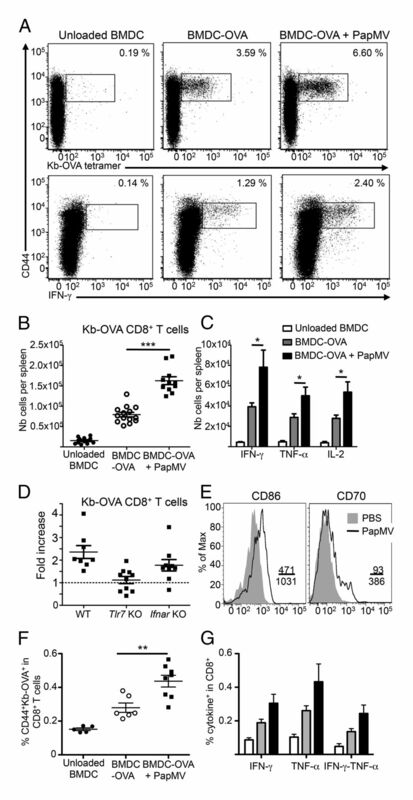 immunization, splenic DCs take up PapMV in vivo and acquire a mature phenotype (22). In addition, we recently showed that s.c (34). and intranasal (27) administration of PapMV leads to the production of proinflammatory cytokines and chemokines. In the present paper, we explored more deeply the immunogenic properties of PapMV upon i.v. immunization. Twenty-four hours after injection of PapMV in mice, we observed that CD8+ and CD4+ T cells, B lymphocytes, macrophages, monocytes, and DCs isolated from the spleen, the blood, and the peripheral lymph nodes showed increased expression of activation markers demonstrating the induction of a generalized state of activation of the immune system. This was observed only with the complete nanoparticle and not with the CP. PapMV nanoparticles are produced in vitro from monomers of the capsid protein and a synthetic ssRNA by self-assembly into a filamentous rod-shape nanoparticle. Thus, the composition of the complete nanoparticle and of the CP differs only by the presence of the nucleic acid. This strongly suggested that the ssRNA was responsible for the immunogenicity of the PapMV. This hypothesis was further supported by the fact that PapMV failed to induce the activation of immune cells in mice deficient in TLR7, MYD88, or IRF5/7. Furthermore, IFN-α, a cytokine produced upon TLR7 activation, was rapidly detected in the serum and spleen of immunized mice. We next sought to determine whether the generalized immune activation observed following PapMV administration was resulting from this strong IFN-α production. Indeed, absence of the type I IFNR completely abolished the immunomodulatory effect of PapMV nanoparticles on immune cells in vivo. Moreover, similar results were obtained following depletion of BST2-positive cells, which in naive mice, mainly consists of pDCs, the main source of IFN-α. We thus suggest that following immunization with PapMV, pDCs, and most certainly other APCs, as we have shown previously (22, 30, 35), take up the particles and degrade them in the endosome allowing recognition of the ssRNA by TLR7, which leads to a massive production of IFN-α in a MYD88 and IRF5/7-dependent fashion. Subsequently, IFN-α is detected by various immune cells through IFNAR leading to their activation as observed by an increased expression of activation markers such as CD69, costimulatory molecules like CD86 and MHC proteins, and the production of other immune mediators such as the proinflammatory cytokine IL-6. Having uncovered a major role played by TLR7 in the activation of the innate immune response following i.v. immunization with PapMV, we next analyzed its impact on the humoral immune response. We observed that in the absence of TLR7 and even more in the absence of MYD88, production of PapMV-specific IgG and IgM was greatly reduced. Because absence of MYD88 had a greater impact on PapMV-specific IgG production than TLR7 deficiency, it is possible that PapMV activates another MYD88-dependent receptor such as TLR8. In fact, TLR7 and TLR8 are known to sense similar ligands such as ssRNA and small synthetic molecules like imidazoquinolines and nucleoside analogs. In addition, many ligands (CL097, CL075, R848, and poly(dT)) are known to activated both. Therefore, we cannot exclude the possible implication of TLR8 in IgG production following PapMV immunization. However, the involvement of TLR8 in the activation of immune cells and IFN-α production seems negligible because absence of TLR7 completely abrogates the effect of PapMV on these processes. In addition, absence of type I IFNR only transiently decreased the amount of IgG in the serum of immunized mice. This result suggests that detection of PapMV by TLR7 on B lymphocytes is required for specific Ab production, whereas B lymphocyte activation by IFN-α is not necessary. Consistent with this hypothesis, it was demonstrated that, in an immunization context involving a pattern-recognition receptor ligand, direct pattern-recognition receptor stimulation of B cells was required to obtained a robust Ab response (36, 37), especially when immunization was performed with VLPs (38). Moreover, Le Bon et al. (39) showed that type I IFN enhances humoral immunity and promotes isotype switching by stimulating DCs. We showed that IgG isotypes produced following PapMV administration were mainly composed of IgG2c and IgG3 with low IgG1 titers arguing for the skewing of the CD4+ T cell response toward a Th1 phenotype. In addition, IgG3 production is indicative of a T-independent Ab response in the presence of IFN-γ (40). This is likely the result of the direct cross-linking of specific B cell receptors by repeated antigenic patterns found on the surface of PapMV nanoparticles, which could induce Ab production without help from CD4+ T cells. Although some studies have shown that Abs directed toward a vaccine platform can be detrimental to the effectiveness of a recall injection (41), the presence of high levels of Abs against PapMV does not affect the efficacy of a booster vaccination (19, 27, 34). The cellular immune response is critical for the control of viral infections, intracellular microbial infections, and cancer (4, 5, 42–44). To determine the capacity of PapMV to enhance T cell–mediated immune responses, we used PapMV as adjuvant in a BMDC-OVA vaccination regimen. We observed an increased proportion of OVA-specific effector CD8+ T cells producing cytokines such as TNF-α, IFN-γ, and IL-2 when PapMV was administered before BMDC-OVA vaccination. It is noteworthy that this increased number of OVA-specific effector CD8+ T cells was not observed in Tlr7 KO mice highlighting once again the importance of this receptor in the immunogenic effect of PapMV. Interestingly, absence of IFNAR did not abrogate totally the effect of PapMV on the number of OVA-specific CD8+ T cells. In past years, several studies have shown that direct stimulation of T cells by IFN-I was required for optimal CD8+ T cell responses (45, 46). In our case, it seems that IFN-I produced following PapMV immunization acts not only on CD8+ T cell but also directly on injected BMDC because IFN-I produced in Ifnar KO mice can act only on these cells because they are the only ones expressing the IFNAR. In addition, it was shown that IFN-α facilitates terminal differentiation of DCs in vitro (47). Accordingly, we observed that pretreatment of mice with PapMV increases the expression of costimulatory molecules on injected BMDC, which could explain the adjuvant effect observed with PapMV. CD4 help is very important for the functionality of the memory CTL response induced following BMDC immunization (48). Because we have shown that PapMV immunization induces CD4+ T cell activation, it is possible that CD4 help plays a role in PapMVs enhancement of CTL responses. In addition, it has recently been shown that the CD4 help signal is transmitted from Ag presenting cells to CD8+ T cells via CD27–CD70 interactions (49). In agreement with these results, we observed that PapMV induced an increased expression of CD70 on BMDCs. More importantly, PapMV also increased long-term memory CD8+ T cell response, the ultimate goal of any vaccine. Because CD8+ T cells are important to control infection with L. monocytogenes (50, 51), an enhanced memory response should result in better control against a recall infection. Fittingly, we showed that the use of PapMV as adjuvant for a BMDC-OVA vaccine increases the quality of the secondary effector T cell response and protection of mice against a L. monocytogenes-OVA challenge. Thus, we demonstrated that PapMV is a suitable adjuvant for the generation of protective CD8+ T cell responses. The type of immune response generated by a vaccine and therefore the choice of the adjuvant used is crucial to ensure an effective protection or treatment. Thus, increasing efforts are being made to determine the modes of action of adjuvants and to understand the type of immune responses necessary to protect against various infections or disease. The findings of this study are very important to further develop novel effective adjuvants for T cell vaccines. We have established that PapMV is a potent TLR7 agonist that induces strong IFN-α production and broad immune cell activation. TLR7 agonists such as imidazoquinolines (like R837) have been shown to increase the efficiency of vaccines that trigger cellular immune responses against pathogens or cancer (11, 52–55). However, use of imidazoquinolines is limited to specific applications such as topical creams because of their side effects and short half-life when administrated systemically (56). PapMV have not shown any signs of toxicity in vivo in preclinical studies and have a stable repetitive and crystalline structure that protects the ssRNA from degradation and efficiently targets APCs. Other VLPs displaying various TLR ligands have provided encouraging results in various pathological settings. In particular, VLPs loaded with CpG oligodeoxynucleotides (TLR9 ligands) have shown a very promising therapeutic potential against cancer (57, 58) but also in other context such as allergen-specific immunotherapy (59–61). Cancer immunotherapy with DC-based vaccines also has provided great promises in the past few years but requires optimization to become fully effective (62, 63). Our results demonstrate that PapMV is a suitable adjuvant for BMDC-based vaccines that could be applicable to the development of improved therapeutic DC vaccination strategies against cancer and chronic infections. D.L. is the founder and a shareholder of Folia Biotech, a startup company with the mandate to commercialize the PapMV nanoparticle technology. The patent is pending (No. 61/485,955 filed May 13, 2011). We thank P. Pitha-Rowe for providing the Irf5/7−/− mice and C. Daniel, P. Duplay, K. Heinonen, and S. Stäger for critical reading of the manuscript. This work was supported by Canadian Institutes of Health Research Grants MOP-89833 (to A.L. and D.L.) and MOP-115139 (to N.L.). A.L. holds the Jeanne and J.-Louis Lévesque Chair in Immunovirology from the J.-Louis Lévesque Foundation. M.-È.L. acknowledges studentship support from the Natural Sciences and Engineering Research Council of Canada, the Fonds de Recherche Santé Québec, and the Armand-Frappier Foundation. 1977. The eradication of smallpox. Prog. Med. Virol. 23: 1–21. 2005. Vaccines: past, present and future. Nat. Med. 11(Suppl. 4): S5–S11. 2003. The evolution of antigen-specific CD8+ T cell responses after natural primary infection of humans with Epstein-Barr virus. Viral Immunol. 16: 3–16.
. 2001. Dissecting the host response to a γ-herpesvirus. Philos. Trans. R. Soc. Lond. B Biol. Sci. 356: 581–593.
. 1994. Cellular requirements for tumor-specific immunity elicited by heat shock proteins: tumor rejection antigen gp96 primes CD8+ T cells in vivo. Proc. Natl. Acad. Sci. USA 91: 3077–3081.
. 2012. Vaccination-induced functional competence of circulating human tumor-specific CD8 T-cells. Int. J. Cancer 130: 2607‑2617.
. 2007. Additive effects of CpG ODN and R-848 as adjuvants on augmenting immune responses to HBsAg vaccination. Biochem. Biophys. Res. Commun. 361: 537–542.
. 2012. Cell-mediated immune responses to a varicella-zoster virus glycoprotein E vaccine using both a TLR agonist and QS21 in mice. Vaccine 30: 3126–3135.
. 2008. Immunization with a Toll-like receptor 7 and/or 8 agonist vaccine adjuvant increases protective immunity against Leishmania major in BALB/c mice. Infect. Immun. 76: 3777–3783.
. 2011. Protective T cell immunity in mice following protein-TLR7/8 agonist-conjugate immunization requires aggregation, type I IFN, and multiple DC subsets. J. Clin. Invest. 121: 1782–1796.
. 2010. Vaccine delivery: a matter of size, geometry, kinetics and molecular patterns. Nat. Rev. Immunol. 10: 787–796.
. 2003. Virus-like particles as immunogens. Trends Microbiol. 11: 438–444.
. 2008. The coming of age of virus-like particle vaccines. Biol. Chem. 389: 521–536.
. 2002. Critical role for activation of antigen-presenting cells in priming of cytotoxic T cell responses after vaccination with virus-like particles. J. Immunol. 168: 2880–2886.
. 2004. Nonmethylated CG motifs packaged into virus-like particles induce protective cytotoxic T cell responses in the absence of systemic side effects. J. Immunol. 172: 1777–1785.
. 2008. Development of a universal influenza A vaccine based on the M2e peptide fused to the papaya mosaic virus (PapMV) vaccine platform. Vaccine 26: 3395–3403.
. 2008. Melanoma vaccine candidates from chimeric hepatitis B core virus-like particles carrying a tumor-associated MAGE-3 epitope. Biotechnol. J. 3: 1429–1436.
. 2010. Versatile virus-like particle carrier for epitope based vaccines. PLoS ONE 5: e9809.
. 2008. Novel plant virus-based vaccine induces protective cytotoxic T-lymphocyte-mediated antiviral immunity through dendritic cell maturation. J. Virol. 82: 785–794.
. 2013. Engineering of papaya mosaic virus (PapMV) nanoparticles with a CTL epitope derived from influenza NP. J. Nanobiotechnology 11: 10.
. 2012. Engineering of papaya mosaic virus (PapMV) nanoparticles through fusion of the HA11 peptide to several putative surface-exposed sites. PLoS One 7: e31925.
. 2008. Translating innate response into long-lasting antibody response by the intrinsic antigen-adjuvant properties of papaya mosaic virus. Immunology 124: 186–197.
. 2007. Proteasome-independent major histocompatibility complex class I cross-presentation mediated by papaya mosaic virus-like particles leads to expansion of specific human T cells. J. Virol. 81: 1319–1326.
. 2013. Induction of innate immunity in lungs with virus-like nanoparticles leads to protection against influenza and Streptococcus pneumoniae challenge. Nanomedicine 9: 839–848.
. 2005. IL-7 receptor expression levels do not identify CD8+ memory T lymphocyte precursors following peptide immunization. J. Immunol. 175: 4400–4407.
. 2010. Plasmacytoid dendritic cell-derived type I interferon is crucial for the adjuvant activity of Toll-like receptor 7 agonists. Blood 115: 1949–1957.
. 2007. Immunogenicity of papaya mosaic virus-like particles fused to a hepatitis C virus epitope: evidence for the critical function of multimerization. Virology 363: 59–68.
. 2004. Expansion of melanoma-specific cytolytic CD8+ T cell precursors in patients with metastatic melanoma vaccinated with CD34+ progenitor-derived dendritic cells. J. Exp. Med. 199: 1503–1511.
. 2012. Improvement of the PapMV nanoparticle adjuvant property through an increased of its avidity for the antigen [influenza NP]. Vaccine 30: 2535–2542.
. 2011. Improvement of the trivalent inactivated flu vaccine using PapMV nanoparticles. PLoS One 6: e21522.
. 2010. Two distinct chimeric potexviruses share antigenic cross-presentation properties of MHC class I epitopes. Vaccine 28: 5617–5626.
. 2011. Programming the magnitude and persistence of antibody responses with innate immunity. Nature 470: 543–547.
. 2001. Type i interferons potently enhance humoral immunity and can promote isotype switching by stimulating dendritic cells in vivo. Immunity 14: 461–470.
. 1992. Induction of IgG3 secretion by interferon γ: a model for T cell-independent class switching in response to T cell-independent type 2 antigens. J. Exp. Med. 175: 1367–1371.
. 2010. Differential specificity and immunogenicity of adenovirus type 5 neutralizing antibodies elicited by natural infection or immunization. J. Virol. 84: 630–638.
. 2010. Extreme CD8 T cell requirements for anti-malarial liver-stage immunity following immunization with radiation attenuated sporozoites. PLoS Pathog. 6: e1000998.
. 2012. Probing CD8 T cell responses with Listeria monocytogenes infection. Adv. Immunol. 113: 51–80. 1996. Peptide-pulsed dendritic cells induce antigen-specific CTL-mediated protective tumor immunity. J. Exp. Med. 183: 283–287.
. 2012. Type-I IFN drives the differentiation of short-lived effector CD8+ T cells in vivo. Eur. J. Immunol. 42: 320–329.
. 1998. Type I IFNs enhance the terminal differentiation of dendritic cells. J. Immunol. 161: 1947–1953.
. 1999. Dendritic cells need T cell help to prime cytotoxic T cell responses to strong antigens. Eur. J. Immunol. 29: 2826–2834.
. 2012. The CD4+ T-cell help signal is transmitted from APC to CD8+ T-cells via CD27-CD70 interactions. Nat. Commun. 3: 948.
. 1994. Studies with MHC-deficient knock-out mice reveal impact of both MHC I- and MHC II-dependent T cell responses on Listeria monocytogenes infection. J. Immunol. 153: 3116–3122.
. 1996. Primary and secondary immune responses to Listeria monocytogenes. Curr. Opin. Immunol. 8: 526–530.
. 2007. Tumoricidal activity of TLR7/8-activated inflammatory dendritic cells. J. Exp. Med. 204: 1441–1451.
. 2002. Imiquimod 5% cream for the treatment of superficial and nodular basal cell carcinoma: randomized studies comparing low-frequency dosing with and without occlusion. Br. J. Dermatol. 147: 1227–1236.
. 2005. Immunization with HIV-1 Gag protein conjugated to a TLR7/8 agonist results in the generation of HIV-1 Gag-specific Th1 and CD8+ T cell responses. J. Immunol. 174: 7676–7683.
. 2011. Systemic cancer therapy with a small molecule agonist of Toll-like receptor 7 can be improved by circumventing TLR tolerance. Cancer Res. 71: 5123–5133.
. 2011. TLR-7 and -8 agonists as vaccine adjuvants. Expert Rev. Vaccines 10: 405–407.
. 2013. Multifunctional nanoparticles co-delivering Trp2 peptide and CpG adjuvant induce potent cytotoxic T-lymphocyte response against melanoma and its lung metastasis. J. Control. Release 172: 259‑265.
. 2010. Memory and effector CD8 T-cell responses after nanoparticle vaccination of melanoma patients. J. Immunother. 33: 848–858.
. 2009. Use of A-type CpG oligodeoxynucleotides as an adjuvant in allergen-specific immunotherapy in humans: a phase I/IIa clinical trial. Clin. Exp. Allergy 39: 562‑570.
. 2013. A comparison of immunotherapy delivery methods for allergen immunotherapy. Expert Rev. Clin. Immunol. 9: 465–474, quiz 475.
. 2013. Immunotherapy of allergic rhinitis: new therapeutic opportunities with virus-like particles filled with CpG motifs. Am. J. Rhinol. Allergy 27: 206‑212.
. 2012. Cancer immunotherapy via dendritic cells. Nat. Rev. Cancer 12: 265–277.
. 2013. Silencing IDO in dendritic cells: a novel approach to enhance cancer immunotherapy in a murine breast cancer model. Int. J. Cancer 132: 967‑977.